A Few Good Men: Can You Handle The Truth? 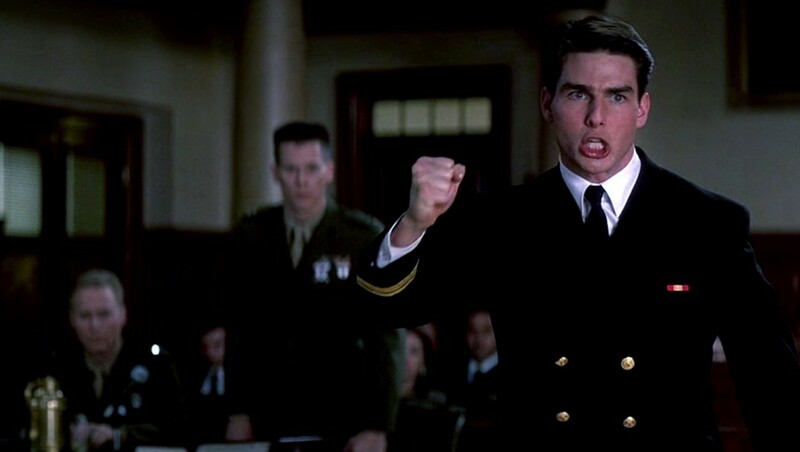 As a part of our coverage of the twentieth anniversary of the release of A Few Good Men, we must dedicate one post to the film’s classic, and most memorable, scene. As you no doubt recall, Jack Nicholson’s character, Col. Nathan Jessup, furiously shouts, “You can’t handle the truth!” It’s the film’s most famous line from its most famous scene. Nearly everyone, lawyers and non-lawyers alike, know the line. Tom Cruise’s character, Lt. Daniel Kaffee, masterfully extracts that statement and subsequent admission of guilt from Col. Jessup. Or did he? Actually, from a trial advocacy perspective, Kaffee’s gambit is a terrible bit of strategic lawyering. By way of refresher, the scene arrives during the end of the trial. Kaffee’s two Marine defendants are on trial for the death of a fellow Marine, who died after they stuffed a rag down his throat as a part of a “code red” hazing. However, the Marine defendants claim that they were just following orders from their superiors. As the trial progresses, things are not looking good for Kaffee and his clients. So Kaffee decides to go for the home run and calls Col Jessup to the stand. The goal: goad Jessup into admitting that he ordered the code red. Seriously, that was his plan. Defendant’s Attorney: Ms. Smith, isn’t it true that my client was traveling only 1 mile per hour when his vehicle struck you, you told him afterwards that you were fine, you had no injuries, and your new complaints of injury are completely fabricated? Witness: No, that’s not true. Defendant’s Attorney: I want the truth! Witness: I’ve already told the truth. Your client slammed into me, and I’ve had serious back pain ever since. Plaintiff’s Attorney: Objection asked and answered. Judge: Sustained. Move along, counselor. If it wouldn’t work on your classic fender bender Plaintiff, we doubt it would work on an experienced field grade military officer. Quite frankly, Kaffee’s strategy is pretty dumb. But hey, it’s Hollywood, and it made for some great cinematic drama. what about strenuously objecting, though? that’s good lawyering, right? Real lawyers demand “strict proof”. Not ordinary proof. Gotta be “strict”–whatever that is.